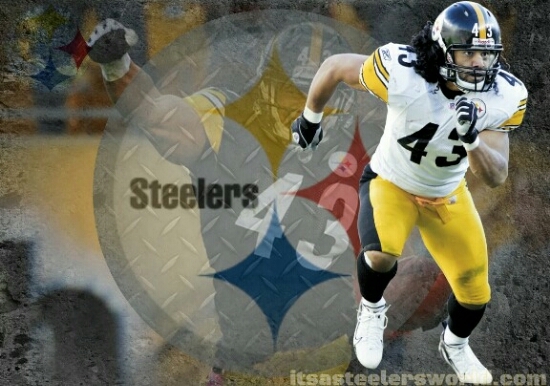 See You In Canton, Polamalu..HOF Bound | "IT'S A STEELERS WORLD"! Well, I wrote about the more than likely possibility that it would happen. And now it has become 100% true fact. Pittsburgh Steelers safety, Troy Polamalu has announced his retirement from the National Football League. All twelve seasons of course spent with the 6X Super Bowl Champions. And although I am sadden that it has come to this, it was in fact an inevitable decision that was bound to be made. I am happy nonetheless. Happy because Polamalu gets to “walk” away from the game healthy and on his terms..no one else’s. And I consider that is the best way to leave the game as opposed to carted or wheeled away. Or leaving in a way I spent time after time defending against a number of Steelers fans..playing for another team. That is what’s important. Troy’s family, health, thoughts and feelings..not ours. While the Steelers will miss Polamalu’s hard-hitting plays and flowing locks, the team was showing signs of wanting to move on. The team brought in Mike Mitchell last offseason, but injuries slowed down his productivity. The team is expected to spend several of its 2015 draft picks on secondary players to strengthen its 30th ranked pass defense. But enough of that. Let’s focus on the man himself. One of the most electrifying, balls out player I have ever had the pleasure of witnessing play the game of professional football. No need to go into his statistics because they clearly speak for themselves. And what they are saying now is “Hall of Fame Bound”. And I am sure everyone associated to the game would agree.